The Brothers of Hesperia Lodge #411 A.F. 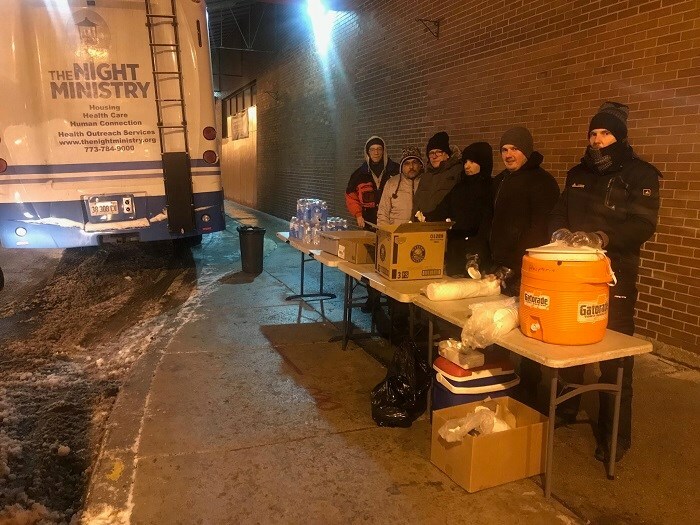 & A.M. of #Chicago had another successful charitable event in partnership with The Night Ministry organization to feed the homeless in the Uptown Chicago, Illinois neighborhood on the north side of the city. On this Super Bowl Sunday, 2/4/18, the Brothers braved the 13 degree temperature and slushy snow from earlier in the day to provide hot meals to members of this community. Seven of the lodge Brothers formed our usual assembly line to provide homemade chicken and lentil soup along with soup crackers, cookies and bottled water to all who came by in search of a meal. The fellowship amongst the Brothers is always strong while working together for such a worthwhile activity; it is a labor of love and a genuine feeling of “making a difference.” Also, the expressions of thanks from the recipients are always greatly appreciated. Though we were not scoring touchdowns, the Brothers of Hesperia Lodge scored big for many people on this frigid Chicago night.